The 1980s were a golden age for horror movies, and many filmmakers today try to recapture that magic in their own films. 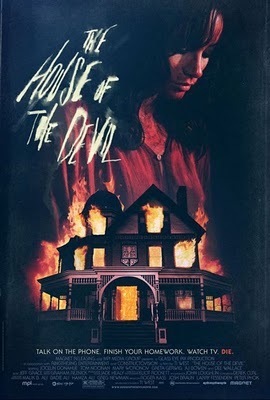 Director Ti West’s film “The House of the Devil” is yet another example, and for the most part, succeeds in his efforts. Making a period horror film for under a million dollars is in itself a great accomplishment. This movie is not without its flaws though. 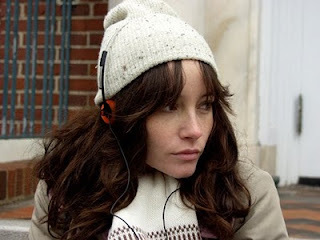 The movie centers on Samantha played quite well by Jocelin Donahue. She is a college sophomore looking to move into her own apartment and get away from the dorms and her inconsiderate roommate. Her best friend is Megan, complete with 80’s hair and attitude. Samantha replies to an ad for a babysitter and sets up to meet the man on the phone, but he stands her up. Being that there are no cell phones we get to see long-lost items like pay phones and rotary phones, ahh that brings me back. The man calls Samantha the next day to apologize and to offer her more money. Megan drives her over to the house and they meet a tall older man with a cane. He comes clean that it's not you average babysitting job and ups her pay. She accepts $400 for a few hours of work. As you might have guessed the movie is called “The House of the Devil” for a reason. Instead of babysitting a child, Samantha’s job is to watch over “mother” who is in a second-floor room. A great deal of the movie involves Samantha roaming the house and checking things out. Like most babysitters she’s bored has some time to waste. She calls Megan a few times but she has yet to return home. We see that Megan’s fate is one of the films best and surprising horror scenes. This film has angered a lot of casual horror fans in the fact that there is not a lot that really happens. It’s a very slow burn type of story and very atmospheric. This makes the last fifteen minutes of the film that more intense. That family has something horrific in store for Samantha when they return. My biggest gripe with the film is the completely illogical final minutes. Maybe that has something to do with the 80’s time period but its just like, really? All in all this film is made for a very specific audience and not many people will ever see it, but for director Ti West this is another stepping stone in what looks to be a growing career. He has most recently finished making Cabin Fever 2 and will be filming “The Innkeepers” soon. For horror fans, he is definitely a talent to keep your eye on. "Dance of the Dead" A Teen Comedy with Zombies! "The Children" Creepy Kids and they're BRITISH! "The Descent" Chicks with Piks! "The Tracey Fragments" More Ellen Page! "Hard Candy" Ellen Page Rocks the House! "The Hills Have Eyes" (2006) - Buckle up!! "American Psycho" An American Masterpiece!